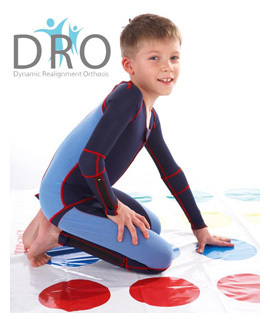 The Dynamic Re-alignment Orthosis (DRO) is a made-to-measure product, designed and produced to the finest detail to provide dynamic compression to increase sensory and proprioceptive feedback and provide musculo-skeletal support. This Lycra garment can assist and lead to motor learning and neural integration. Through the use of a DRO providing constant support and sensory information the patient is given the effect of therapeutic handling for the time that the garment is worn. Clinical observations and studies have shown that people with abnormal muscle tone have a capacity for achieving control over movement when suitable feedback is provided. With adequate musculo-skeletal alignment and postural stability and control, functional performance is enhanced. The evidence available shows that wearing the DRO leads to an improvement in positioning, posture, and function. This is thought to be due to the stimulation of the somatosensory and musculo-skeletal systems leading to changes in tone; postural alignment, improved proximal stability, and improved biomechanical advantage for muscle activation and enhancement of learning strategies. "Lycra Garments Designed for Patients with Upper Limb Spasticity: Mechanical Effects in Normal Subjects"
Gracies JM, Fitzpatrick R, Wilson L, Burke D, Gandevia SC. Objective: To assess the stretch of pronator muscles produced by a specifically designed upper-limb Lycra garment that could have a better acceptability than rigid splints in treating upper-limb spasticity. Design: Double-blind comparison among three garments. They were designed to produce a supinating, a pronating, and no torsional force, and were individually manufactured and tested in 10 healthy volunteers. Main Outcome Measure: Angular position and passive rotational stiffness of the forearm were measured with and without each of the garments immediately after the garment was fitted and every hour for 6 hours. Results: When put on by a trained person, the supinator garment supinated the forearm in all subjects (mean, 17°; p < .01; range, 5° to 44°) while the pronator garment pronated the forearm in 8 of 10 subjects (mean, 5°; p < .01). These effects gradually decayed over 6 hours, as garment position was not readjusted. Passive rotational stiffness of the forearm increased by about 30% with each type of garment. The garments designed to produce no torsional force exerted no intrinsic rotational effect. Conclusion: Individually-made Lycra garments can produce continuous stretch of muscles for several hours and may be useful in the treatment of spasticity. The garments, however, must be put on by a trained person and their position adjusted when necessary. To read the study, visit: download.journals.elsevierhealth.com/pdfs/journals/0003-9993/PIIS0003999397901295.pdf. Dynamic Lycra pressure orthoses (or garments) have been used in recent years as a treatment modality for children with motor impairment, namely cerebral palsy. Improving function is the ultimate goal of prescribing such garments, but there are other important beneficial effects, such as improving proximal stability to help posture and function. This article attempts to explain, in view of current knowledge, how and why dynamic Lycra pressure garments are used and their benefits to children who wear them, providing an outline of current theories behind their function. Two case reports are detailed and some areas for further research are identified. Peter was a 9-year-old boy with spastic athetoid quadriplegia. His tone was generally high with moderate to severe spasticity and involuntary athetoid movements in both upper and lower limbs. He also had a severe postural scoliosis and subluxation of the left hip and his head control was very poor. Peter was dependent on his carers for all self-care activities and feeding was carried out through a gastrostomy tube. He was mobile in an electric wheelchair and communicated mainly through electronic equipment attached to his wheelchair. Orthotic management consisted of a thoracolumbosacral orthosis (TLSO) to control posture and enhance proximal stability and a hip abduction orthosis to prevent subluxation of the hip joints and to improve sitting posture. Independent and unsupported sitting was not possible, as Peter tended to slide into a sacral sitting posture and could not weight-bear on his upper limbs. While he did not mind wearing the hip abduction orthosis, he strongly disliked the TLSO as this restricted his movements extensively and interfered with speech and feeding. In view of all this, an assessment for a dynamic Lycra orthosis was carried out, with the aim of making Peter more comfortable without compromising control of posture. It was decided that Peter should be fitted with a Lycra body suit, which extended from the neck to the knees with short sleeves. The back and sides of the suit were reinforced with layers of Lycra to improve proximal stability and extra zips were added to allow access for personal care. Once fitted with the suit, Peter’s posture immediately improved: he could sit independently at the edge of a bed, taking weight on both upper limbs, and hold the position for 30 s. An opening made in the Lycra facilitated feeding through the gastrostomy tube. He no longer needed the TLSO, as proximal stability had been enhanced by the compression applied by the garment onto the trunk. His head control and clarity of speech also improved. Overall, Peter was very pleased and happy to wear the Lycra suit; he quickly recognized the benefits so that he preferred to wear the suit than be without it. Mary was a 6-year-old girl with left-sided hemiplegia. Muscle weakness in the upper and lower limbs on the affected side resulted in increased tone with a flexion pattern predominant in the upper limb and an extensor pattern predominant in the lower limb. Mary’s speech was unimpaired and she attended a mainstream school. Functionally, her main problem was fine hand movements and coordination on the affected side, mainly owing to weakness in the wrist extensors that resulted in flexion of the fingers and a flexed and adducted thumb. There was also lack of symmetry in overall posture and she tended to ignore the affected side during task performance. Mary's management consisted of occupational therapy and physiotherapy, as well as lower limb orthotics to stabilize the ankle and improve gait. Wrist-hand orthoses were tried, but besides hindering function and dexterity, she found them difficult to tolerate. Thus, she was assessed and provided with a dynamic Lycra orthosis. Both Mary and her mother were very keen to learn as much as possible about these garments. All the information available regarding Lycra garments was given to them before Mary was assessed. Assessment was carried out in a multidisciplinary team setting and it was agreed that the main area of concern was fine motor coordination of the upper limb. The Lycra garment made for Mary consisted of a long glove to the axilia, with finger involvement to the proximal interphalangeal joints and the interphalangeal joint of the thumb. The glove included a zip on the dorsal aspect extending from the metacarpophalangeal joints to just below the elbow, to make putting on the garment easier. On putting on the glove, there was an immediate and visible effect: the wrist extended to a neutral position and there was extension of all the metacarpophalangeal joints, accompanied by extension and abduction of the thumb. This allowed the hand to be placed in a more functional position. Proximally, elbow extension was more evident when in a state of rest, thus rendering a more symmetrical overall posture of the upper body. In the weeks that followed fitting, Mary became more confident functionally and socially, and was more aware of her affected side, thus attempted bilateral tasks more readily. To read the study, visit: www.ijtr.co.uk/cgi-bin/go.pl/library/abstract.html?uid=13384. Treatment of scoliosis has been under discussion in relation to surgical intervention since the Boston brace was presented by Hall in 1976 (Hall et al. 1976; Watts et al. 1977). The effects of rigid bracing on thoracic skeletal integrity and the possible deformation of ribs due to the high localized pressure due to prolonged wear (Biorthex 1999; Coillard et al. 1999) have been highlighted. The lack of compliance (Houghton et al. 1987) has encouraged clinicians to investigate other options for non-surgical treatment. The Spinecor and Triac bracing systems have been developed as a result of this research; however, both of these orthoses had been designed with idiopathic scoliosis in mind. 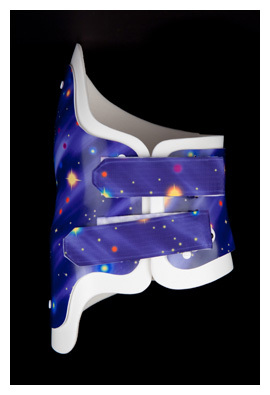 Little research has been done into the effects of bracing on the neuropathic curve. The use of dynamic Lycra® garments in the treatment of neurological scoliosis offers the advantage of deformity correction without the bulk and discomfort of rigid braces. Recent clinical experience has shown that the Lycra® suits have a positive effect in the treatment of scoliosis. This study discusses the treatment of a child presenting with a spinal tumour and although not truly of neurological presentation indicates that the garment can be used for the different scoliotic presentations. To read the study, visit: poi.sagepub.com/content/30/2/174.long#sec-3. The Scoliosis Research Society (SRS) is an international society that was founded in 1966 with 35 members. It has gained recognition as one of the world's premier spine societies. The SRS has maintained a commitment to research and education in the field of spinal deformities. Strict membership criteria ensure that the individual Fellows support that commitment. Current membership includes over 1,000 of the world's leading spine surgeons, researchers, physician assistants and orthotists who are involved in research and treatment of spinal deformities. The purpose of the Scoliosis Research Society is to foster the optimal care of all patients with spinal deformities. B. Stephens Richards, MD, is the president of the SRS Board of Directors. He is the Chief Medical Officer at the Texas Scottish Rite Hospital for Children. To read the paper, visit www.aaos.org/about/papers/position/1122.asp or jbjs.org/article.aspx?Volume=90&page=195. Dr. Richards received his medical degree from the St. Louis University of Medicine and completed his surgical internship at the University of Utah. He completed the Harrington Fellowship of Pediatric Orthopaedics and Scoliosis at Texas Scottish Rite Hospital for Children in 1987. Dr. Richards is a professor in the department of orthopaedic surgery at The University of Texas Southwestern Medical Center at Dallas and is an active staff member at Children’s Medical Center Dallas and a consulting staff member at Presbyterian Hospital in Dallas. He is a member of the American Orthopaedic Association; the American Academy of Orthopaedic Surgeons; the American Medical Association; the Dallas County Medical Society; and the Texas Medical Association. He is the current President of the Scoliosis Research Society and is past chairman of the Pediatric Orthopaedic Society of North America. He is on the editorial board of the Journal of Pediatric Orthopaedics and is a consultant reviewer for Spine. The National Government Services Jurisdiction B DME MAC Medical Review Department has sent out letters to providers regarding a review of high dollar durable medical equipment, prosthetics, orthotics, and supplies (DMEPOS) claims. A widespread prepayment medical review is a selection of paid claims reviewed for medical necessity based on a particular service from multiple suppliers. Noridian Administrative Services (NAS), the Jurisdiction D Durable Medical Equipment Medicare Administrative Contractor (DME MAC) announced a review of the following Healthcare Common Procedure Coding System (HCPCS) codes. According to NAS, all suppliers billing Jurisdiction D for these HCPCS codes are subject to this review. Suppliers of the selected claims will receive an Additional Documentation Request (ADR) letter asking for specific information to determine if the item billed complies with the existing reasonable and necessary criteria. Failure to supply the requested information within 45 days of the date on the letter will result in the claim being denied. If a notification letter is sent, suppliers must respond with all documentation within the timeframe published on the letter. Suppliers are in violation of Supplier Standard #28 when, upon request, they fail to provide requested documentation to a Medicare contractor. All notification letters will be sent to the correspondence address on file for suppliers. This address is the same address of where paper checks, paper remittance advices, and other notifications from Medicare are sent. Beginning Oct. 1, 2012, through Dec. 31, 2012, the Centers for Medicare and Medicaid Services (CMS) will begin implementing an advance review process for Part B therapy claims that exceed a $3,700 threshold. A provider is responsible for checking the Common Working File (CWF) to determine if a patient has previously received services that would exceed the threshold. Remember that information in the CWF is only as accurate as the last bill that has been processed. However, CMS indicated that providers would not be penalized if another provider submits a late bill. In addition, beginning Oct. 1, 2012, services provided at hospital outpatient therapy departments that were previously exempt from the cap will be included. If it is determined that a beneficiary will exceed the $3,700 threshold, providers must get advance approval for services. Rather than have the Medicare Administrative Contractors (MACs) be overwhelmed with manual claims review activities come Oct.1, 2012, CMS is assigning providers to three phases beginning Oct.1, Nov.1, and Dec.1. All phases go through Dec.31, 2012. Each provider will be notified by mail by Sept. 1, 2012, as to which phase they are assigned. CMS is mailing letters to those providers who billed Part B therapy in 2011. Any providers who have not billed or are new, will be included in Phase III. CMS will also list the providers in Phase I and Phase II on their website; if you are not listed, then you are in Phase III. It is important to note that the letters will be sent to the address in the provider’s NPI record. Additionally, a provider that has multiple NPIs could be in multiple phases based on the individual NPIs. The grouping is based on billing characteristics and then adjusted so that the MACs do not get an overload in any particular phase. The MACs will have 10 days to respond to a provider’s request for advance exception. If a decision is not made within that time, the request will be automatically approved. Contractors will use Section 220 from the Medicare Benefits Policy Manual, Chapter 15, when determining if services above the threshold should be approved. Advance approval is not a guarantee of payment. All claims are subject to medical review. If a provider fails to obtain an advance approval, no payment will be made for services over $3,700, and a request for medical records will be sent to the provider. Claims will be reviewed according to the normal claims review process and could take 45-60 days before a decision is made and the claim is either paid or denied. An FAQ on the subject can be found at www.cms.gov/Research-Statistics-Data-and-Systems/Monitoring-Programs/Medical-Review/Downloads/TherapyQAV4_080112.pdf. On Aug. 23, Health and Human Services (HHS) Secretary Kathleen Sebelius announced the next steps in the Obama administration’s work to help doctors and hospitals use electronic health records. Under the Health Information Technology for Economic and Clinical Health (HITECH) Act, doctors, health-care professionals and hospitals can qualify for Medicare and Medicaid incentive payments when they adopt and meaningfully use certified electronic health record (EHR) technology. More than 120,000 eligible health-care professionals and more than 3,300 hospitals have qualified to participate in the program and receive an incentive payment since it began in January 2011. That exceeds a 100,000 goal set earlier this year. HHS' Centers for Medicare & Medicaid Services and HHS’ Office of the National Coordinator for Health IT released final requirements for stage 2 that hospitals and health-care providers must meet in order to qualify for incentives during the second stage of the program, and criteria that electronic health records must meet to achieve certification. Make clear that stage two of the program will begin as early as 2014. No providers will be required to follow the Stage 2 requirements outlined today before 2014. Outline the certification criteria for the certification of EHR technology, so eligible professionals and hospitals may be assured that the systems they use will work, help them meaningfully use health information technology, and qualify for incentive payments. Modify the certification program to cut red tape and make the certification process more efficient. A fact sheet on CMS’s final rule is available at www.cms.gov/apps/media/fact_sheets.asp. A detailed fact sheet on ONC’s standards and certification criteria final rule is available at healthit.hhs.gov/standardsandcertification. The final rules may be viewed at www.ofr.gov/inspection.aspx?AspxAutoDetectCookieSupport=1. More information on the Stage 2 rule can be found at the CMS EHR Incentive Programs website at www.cms.gov/EHRIncentivePrograms. Please feel free to submit your questions on the Professional Technologies International Dynamic Re-alignment Orthosis (DRO) as well as any other issue you would like addressed.